There’s always so much pressure when putting together a couples costume. First of all, you need to put together a look that matches, otherwise no one will be able to tell that you’re a couple from a glance. You also need something that’s easy for both of you to wear. Nothing is worse than one member of the duo having tons of fun, while the other is trying to readjust their outfit the entire night. Lastly, there’s always an expectation that your couples costume has a touch of humor to it. Your couples look needs to get a few chuckles throughout the night! So, where do you even begin? Two words: cheese and crackers. Now, hear us out. 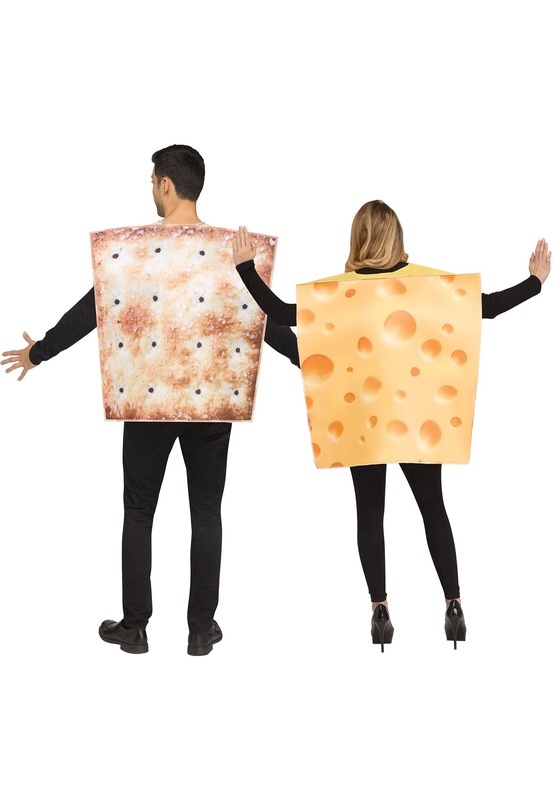 Cheese and crackers are the perfect duo to dress up as during your next costume party. Food costumes are always a funny choice, but beyond that, this particular costume choice allows you to set up some pretty great jokes. You can be cheese, since you’re always kind of “cheesy” and your partner can be crackers because they’re sometimes a little “flaky”. Or maybe your sense of humor is a little “dry and salty” and your partner is just no Gouda at jokes. Start using those jokes while you wear this outfit and you’ll be the hit of the party! 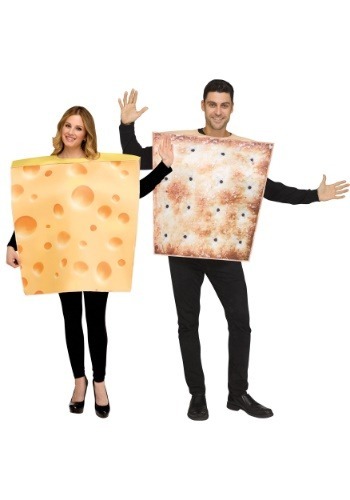 This Cheese and Crackers couples costumes comes with everything you need to turn you and your partner into a coordinated look for the party! It comes with one polyfoam cheese tunic, which is designed to look like a slice of Swiss cheese. It also comes with a cracker shaped tunic, which is designed to look like a saltine cracker. Each tunic fits easily over your normal clothes, so it’s a quick and easy way for you and your partner to get a funny couples look in a matter of minutes.